Hi everyone, I started training handstand side bend 3 months ago, but I'm not very happy of results. ( I enclose 2 photos ). How I can improve it ? My right side is more strict than left. -shoulders not elevated that made the alignment less effective. I would like to see your normal handstand from a side view. Ok Alessandro, I enclose a photo. 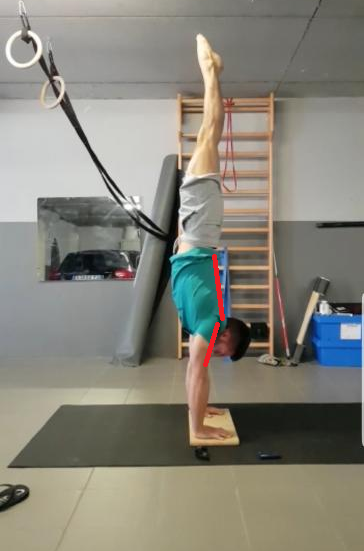 If these lines are not aligned then the basic handstand is not correct and I cannot suggest you train the basic of one arm variation or bending variation. Also, your head position is not correct. If the missed alignment is a problem of technique and not mobility you should be able to perform this exercise with all your back in contact with the wall with no problem, if not you lack of mobility in the shoulder. Where is the correct head position ? I'm able to perform this exercise. Also in this example the alignment isn't correct ? If it isn't correct what do you suggest me ? I have to push more with my shoulder? for the head position, you should be able to barely see your thumbs. Ok perfect ! Thanks! So for the exercise of side bend what do you suggest to me ? Sincerely is hard to say because when you bend to the side a twist happens into your hips, it can be an imbalance in the hips or in the ability to bent the spine in one side. a physiotherapist should be able to check for possible imbalances, then if you have them, work on them. Ok, many thanks Alessandro, you are always kind !